Romans 6 answered the question of the believer’s relationship to sin. The believer died to sin, and therefore should not, and may not live in sin any longer. Romans chapter 7 introduces one more question: what is the believer’s relationship to the law? As Paul addresses this question, the Spirit directs him to Jesus Christ and how the believer’s union with Him. Since the believer is a member of the bride of Christ, he/she is married to Christ. But before that marriage could take place the former relationship had to end—the relationship we had with the law. How did our relationship with the law end? Did we divorce the law? No, that is not how it happened. Rather, we died to the law. As in Romans chapter 6, the thought concerns our union with Jesus. In Romans 6 we died to sin because we were crucified with Christ; we live to God because we were raised with Jesus Christ. 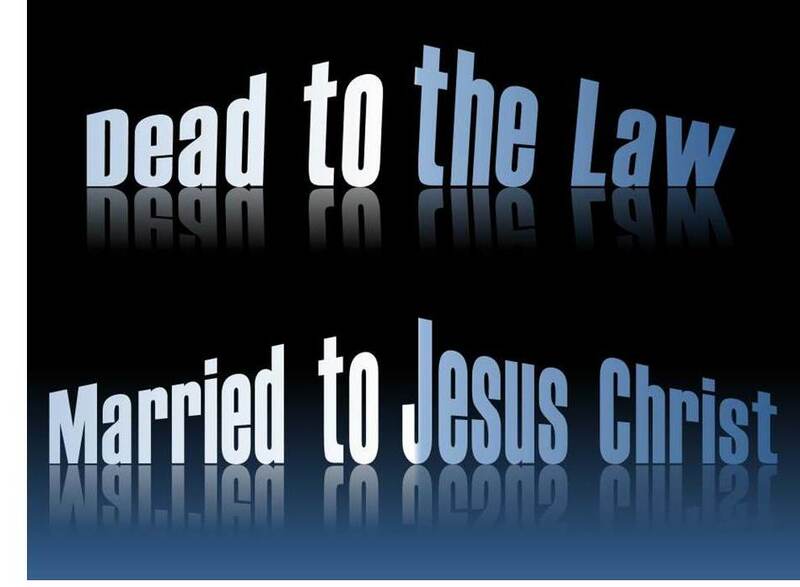 In Romans 7 we died to the law, which grants us the right to be married to Christ. We died to the law through the body of Christ, i.e. through His death at Calvary. So again, when He died, so did we … and this time our death was death to the law. That’s a good thing for us. The law was a demanding partner. It did not love us, it was not merciful, and was not gracious to us. The law could only hold us accountable for failure to obey it. Just as police officers do not reward those who obey traffic laws, the law did not (necessarily) reward us for times we may have kept it. So now the believer is married to Christ. In Biblical marriage, two become one. In the same way, the believer is one with Jesus. He is in us, and we are in Him. He has wholly committed Himself to us for our care and preservation (John 10:14-15, 27-28). He loves us; He is ever gracious to us. He lives His life in us. Whereas our relationship with the law could not produce a fruitful life, our marriage to Christ does. Jesus, as the true Vine, provides His life in us so we become fruitful branches (John 15:1-8). As we live in Him and He lives in us, we bear much fruit. We can do nothing without Him (John 15:5), but He can do anything in and through us. Christianity, therefore, is not legally based, but is a personal relationship with God through our oneness with Jesus. Christianity is a life, which is why it is called the Christian life. We are free to love God and others, free to live life guilt-free, free to abide in Christ, and free to obey and serve Him. 1. What are the limitations and duties of the law? How does it treat us? 2. Why was it necessary for us to die to the law? What does that allow the believer to do? 3. Describe how a relationship and union with Christ enables us to bear fruit. How does this teaching affect the way you approach your Christianity?